Traditionally, we have always been committed to good taste and therefore we manufacture extracts & flavourings with first class sensory qualities and convincing flavour. Traditionally, we have always been committed to good taste and therefore we manufacture products with first class sensory qualities and convincing flavour. For that purpose, we apply best raw materials, sophisticated technologies and our comprehensive knowledge. An enormous range of RAPS extracts, extract blends and flavourings are available in liquid, emulsified and dry product form and, of course, we also develop tailored solutions for your product. We would be pleased to discuss your individual inquiries in a personal meeting. Just leave us your contact details and we will contact you. HIGH-PRESSURE EXTRACTION is used to obtain natural, highly concentrated extracts of the utmost quality. RAPS HIGH PRESSURE TECHNOLOGY is a very special process that uses liquid carbon dioxide under high pressure to dissolve the valuable flavour and aroma compounds of a product. The result: absolutely natural extracts in a perfect standardised quality. CPF TECHNOLOGY can be used to transform liquids perfectly into dry powder form product. The Concentrated Powder Form technology is suitable for a wide range of fluids: watery and alcohol-based solutions, vitamins, flavourings, vegetable oils and fats, essential oils – and also plant extracts. For the best and full flavour, RAPS uses a particularly gentle cold pressing process. 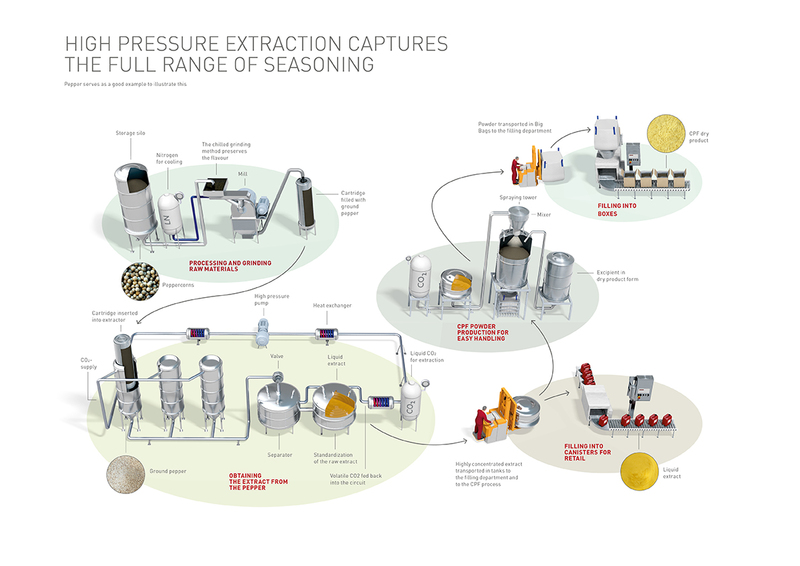 The so-called Plant Press Extraction works at temperatures of up to 40 ° C and was specially developed in order to preserve the intense taste and aroma of even the most sensitive herbs. RAPS HERB OIL CONCENTRATES are ideal for numerous applications, including delicatessen products, soups, sauces or dairy products. Liquid or in dry powder product form, RAPS seasonings offer a well-balanced flavour profile and outstanding intensity. TOPLINE – the combination of high-quality extracts with the best flavour and fine-tuned spices. 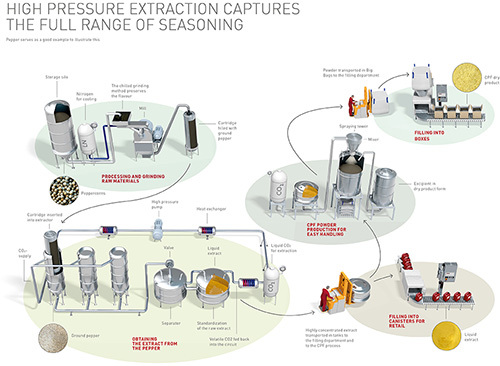 A new generation of extracts for exceptional taste experiences: For RAPSENSATION we combine selected raw spice extracts. Our RAPSOLUTION products are compositions of different spice extracts and spices and combine a convincing taste and an optimal function in a unique way. Discover our comprehensive portfolio of high-quality flavourings. Something very special is our FLAVOCAPS technology: This microencapsulation allows a targeted controlled flavour release. The FLAVOCAPS technology protects the flavours and aromas and assures that they will be released exactly at the right time. Conventionally manufactured flavourings quickly ''evaporate'' and light and oxygen affect their taste. We encapsulate sensitive, volatile aromatic substances into a matrix of maltodextrin and starch. The microencapsulation opens only in the product or during the consumption. The world of flavours is versatile. More than 10,000 flavouring agents have been identified so far. RAPS offers a wide range of flavours; here you will find an adequate one for any application. With rubs, sprinkles and seasoning sauces you can apply a lot of flavour to the surface of meat, but if the taste has to penetrate deep within, then INJECTIONS are the way to go. With lots of flavour-intensive extract mixtures, you can conjure up best results: Butter, Garlic & Herb, Lemon, Moroccan, Thai, Spiced Orange or Sundried are just a few examples. And suitably, of course, also available as sprinkle.